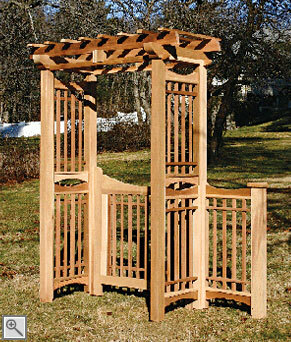 While an Asian influence is evident in this arbor, the dominant feeling is one of refined simplicity. 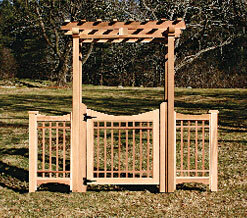 With understated elegance, this stylish pergola structure would work beautifully as an entrance to a garden. Available with the Malibu Arbor Gate and the Malibu Extensions as shown, or with any of our other gate and extension styles as referenced in our Arbor Gates and Extensions section. Constructed of clear, kiln dried western red cedar, 4" x 4" posts, Cambara mahogany lattice and stainless steel fastenings. The opening for this arbor may be altered to any size up to a 5' width. Copyright © 2009-2016 Trellis Structures. All rights reserved.